Does Golden Milk Live Up to the Health Hype? You may have heard of a new trendy drink called golden milk (also known as turmeric latte) popping up in your favorite corner coffee shop. Golden milk may be having its day in the sun, but for some, it's a decades-long traditional drink. Golden milk, or haldi doodh, is a traditional Indian beverage made with milk and turmeric. Turmeric is the spice that gives the milk its golden color. The milk — any type you like (cow, almond, coconut, soy, etc.) — is the vessel for consuming the popular spice turmeric, which has long been regarded as a remedy for many ailments and is known to be a potent anti-inflammatory food. Most often golden milk is used to help remedy gastrointestinal issues, colds and sore throats. While it’s not known how long golden milk has been consumed, its reputation as a health aid in India predates its current mainstream popularity. It’s been used for centuries in Indian kitchens and is regularly consumed by both children and adults. The book “Herbal Medicine” indicates that turmeric has been used in India for more than 4,000 years. Most of the turmeric consumed throughout the world comes from India, and Indians consume 80 percent of what they produce. Turmeric is also grown in Asia and Central America. Turmeric has long been studied for its health benefits. It's high in a polyphenol called curcumin, which is the component responsible for all of the positive health outcomes. Even though most people believe all of the health benefits from golden milk come from turmeric, there are some benefits from the milk, too! Both dairy milk and turmeric have been independently and extensively researched for their roles in health. When combined, these two create a powerful nutritional duo. Here are some of the proven benefits of golden milk. Turmeric (specifically curcumin) is great at fighting and preventing inflammation. And while that's a buzzy term these days, it's important to know what that actually means. People with a variety of chronic conditions — including arthritis, allergies and Celiac disease, autoimmune diseases like lupus, inflammatory bowel disease and Crohn’s disease — have systemic inflammation in the body, which can often lead to pain (as in the case of rheumatoid arthritis). And one of the major health benefits of curcumin lies in its ability to reduce inflammation in the body. A 2017 review published in the journal Foods concluded that turmeric extracts were successful in alleviating pain and inflammation in subjects with osteoarthritis, and the results were similar to ibuprofen. While turmeric can't cure these conditions, the reduction in inflammation can help sufferers manage symptoms. Golden milk may also be a way to decrease the amount of germs in your mouth. Emerging research is being done on the anti-inflammatory and antimicrobial properties of turmeric for dental care. Traditional methods of treating tooth pain, gingivitis and bad breath may have side effects for certain people, and while more people are turning to natural ways to help treat dental problems, turmeric is working for some. A 2017 study in the Journal of the Indian Society of Periodontology found that curcumin mouth rinse decreased the inflammation caused by gingivitis and is comparable to chlorhexidine mouthwash, the standard mouth rinse treatment. It’s also been shown to reduce the number of bacteria in the mouth that can cause bad breath. So swish away on your golden milk: You just might be helping your mouth. 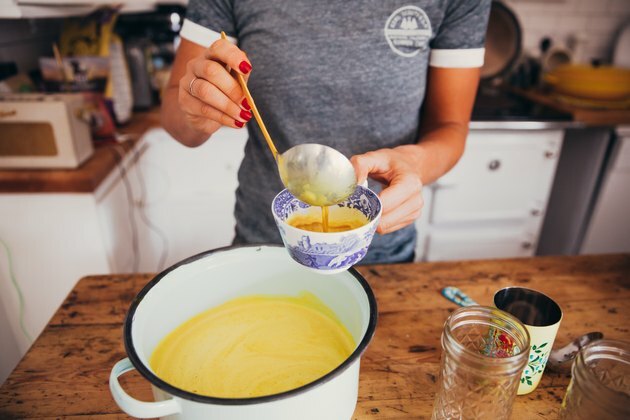 Golden milk may also be part of the next weight-loss craze. Dairy milk contains phospholipids, and these can help the body absorb turmeric more effectively, 2015 research in European Review for Medical and Pharmacological Sciences councluded. Dairy products have already been shown to facilitate weight loss because of the high-quality protein and promotion of feelings of fullness, according to a 2016 review in Food & Nutrition Research. Obesity is often marked with chronic inflammation, which is the main culprit behind many of the problems stemming from obesity. Curcumin is currently being studied as an anti-inflammatory aid that can help reduce the effects of obesity and possibly reduce the fat stored in the body, according to 2017 research in Preventative Nutrition and Food Science. Golden milk is definitely good at all hours of the day, but it may also become your favorite post-exercise drink. Milk has an ideal mix of hydration, carbohydrates, protein, fat and minerals that are perfect for replenishing your body after a hard workout. Add in the anti-inflammatory properties of turmeric and you will be well on your way to recovery. A 2018 study published in Nutrients studied female athletes and found milk to be an effective recovery drink because it reduced muscle loss following sprinting and jumping. And a 2017 study published in Foods indicates turmeric may help relieve exercise-induced muscle soreness. This is most likely attributed to its ability to fight inflammation. So, if you're looking for something that tastes good and can help your body recover after exercise, make golden milk your go-to. Traditional golden milk is very easy to make. 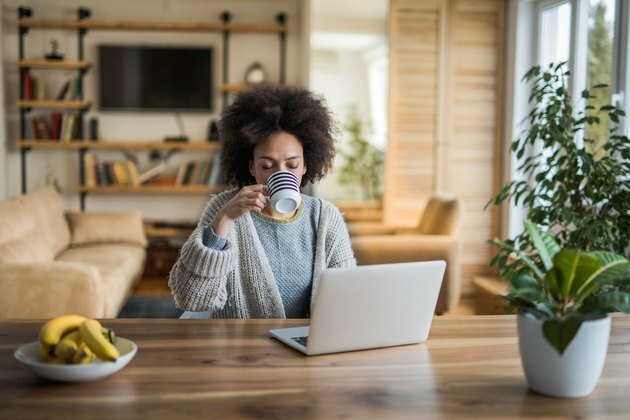 Usually made quickly to help alleviate a specific symptom, it doesn’t have all the bells and whistles you may be accustomed to in other fancy drinks (like your morning smoothie). It can also be consumed hot or cold. If serving warm, heat the milk to a drinkable temperature — not boiling — and then add a pinch of ground turmeric and stir. Occasionally, some people add a small amount of ghee (half of a teaspoon) to help coat and relieve a sore throat. And since much of the turmeric you might eat isn’t absorbed in the body, adding black pepper to your golden milk can help increase your body’s ability to absorb it by as much as 2,000 percent, according to 2017 research in the journal Foods. Good news! There aren’t any known side effects from consuming golden milk regularly, and the FDA classifies turmeric as GRAS (generally regarded as safe). If you have lactose intolerance, though, you’ll want to choose a nondairy option when enjoying golden milk. If you’re drinking large amounts of golden milk (several cups every day), it might be worth mentioning it to your doctor. In particular, if you’re on blood-thinning medication, as large amounts of turmeric can interfere with those types of medications. 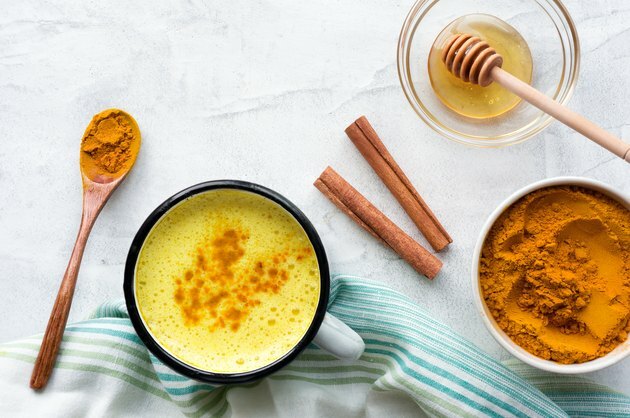 The amount of turmeric used in golden milk is very small, and the chances of overconsuming this spice would be rare, so it’s safe to have more than one serving in a day, as long as it fits in your current diet. Enjoy!